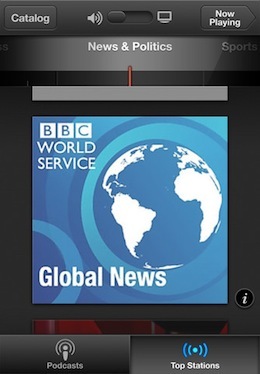 Apple has today launched a new standalone app for Podcasts that runs on iPhone and iPad. This should help to centralize and promote podcast listening and downloading for users, breaking it out of the iTunes Store proper. 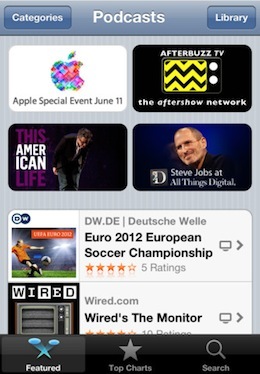 The new app is described by Apple as a way to ‘discover, subscribe to and play your favorite podcasts’. 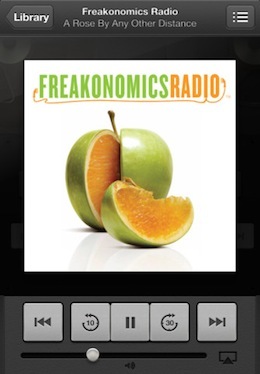 You can watch video podcasts and listen to audio flavors as well. 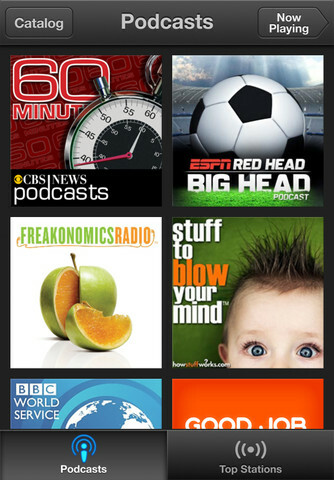 There is a ‘top stations’ section which allows you to see the most popular podcasts in a given topic area as well. The app features much of the standard stuff you would hope to see from a podcast app and the look and feel is very similar to the new iTunes and App Stores found in Apple’s iOS 6 update. 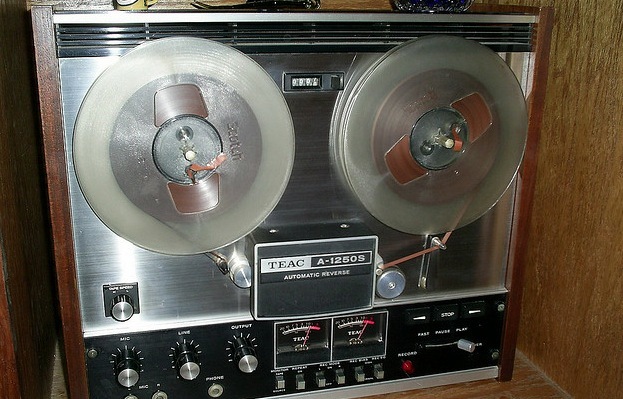 The player interface is pretty cool, with a very ‘tape-decky’ retro look. Playback speeds, bookmarking and jumping are all present, as well as AirPlay support baked right into the app interface. All of the various elements animate and move around when activated. To unveil this, just tap on the album artwork above the playback controls. The interface for downloading new podcasts is the same as in the current store in the screenshots, which is a bit jarring, as it conjoins the new, dark matte interface with the older blue pinstripe variety we’re used to seeing from Apple’s iOS UI. But with the release of iOS 6, the interface will be updated to the new look of the store, so it should mesh well. You can subscribe to your favorite podcasts and will automatically get updates for those podcasts when they’re released. The programs are offered as streaming episodes or as downloadable content, so you can listen while offline. There is also a Sleep Timer for those who want to listen while going to sleep. 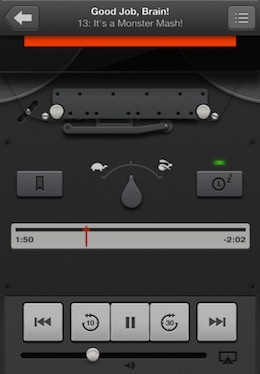 This lets you automatically stop playing a podcast while you’re listening in bed. Twitter, Messages and email sharing are available and you can sync episodes from iTunes as well if you’d rather. Your episodes will also sync between devices for seamless listening. You can download these podcasts on WiFi or 3G connections as well.